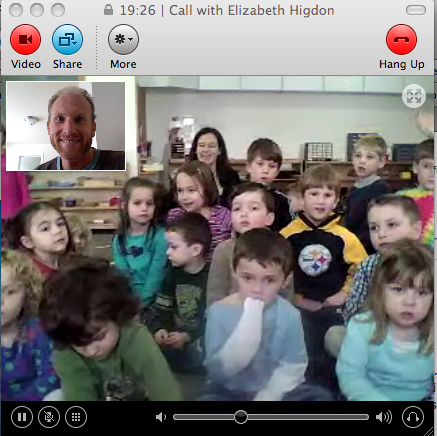 This morning I got to answer questions over Skype from Mrs.Higdon’s Preschool class. Mrs. Higdon (Liz) and I went to college together and now she teaches in northern Indiana. The kids always have great questions and are so curious. These kids, because they live in a cold climate could understand some of the cold concepts better than the kids I’ve done this sort of stuff with in California. While I was in Antarctica I corresponded with Ms. Hernholm’s fourth grade class. One of their in-class assignments was to learn about books. The parts of a book, the cover, the title page, the back cover, reviews and the such. Through the emails the kids were asking me about my favorites and such and they discovered that my great grandmother gave me a little stuffed Curious George doll when I was born. Well, Curious George has traveled all over with me including when we lived in Europe, when I moved to Australia and Japan and he even came down to the Antarctic with me. So, growing up, I was a huge fan of the Curious George books and his adventures. Somehow, Ms. Hernholm’s whole class decided they wanted to make “Curious George goes to Antarctica/South Pole” books! One afternoon I was handed a packet from the mail room and it was full of these Curious George books! They were such fun. I was featured as George’s adventure partner in the books and I took them all up to the galley where I shared them with my Antarctic friends and co-workers. We sat around and each had a look and read the books and passed them along, reading particularly interesting or funny parts of the adventures to each other. After that had passed, I took all the books back down to the mail room and stamped them with our South Pole stamp and brought them back to Ms. Hernholm’s class in San Diego. I did a little slide show for the kids and answered more of their questions. What a blast! If you know of a class of kids who want to learn about Antarctica, let me know. This entry is filed under: Antarctica, Blog, North America, Snow. How do you record Skype calls? I need to know, man. That would be awesome. I didn't record the call, I just took a screen grab of the video chat window. I recon you can google it, eh?